Do you remember the first art movie that you saw? For most kids, anything that isn't their usual fast-paced and colorful entertainment may seem like an art movie, but I'm talking about the first art movie that you watched from beginning to end? For me, it was The Black Stallion, which I saw during its initial theatrical run. Of course, going in, I didn't know that it was an art movie -- The trailers certainly didn't imply that. I was hoping for an adventure movie about a boy and his horse. While The Black Stallion did deliver on that promise, it is also so much more and it found a place in my growing mental catalog of filmmaking techniques. The Black Stallion opens in 1946, where we find young Alec Ramsey (Kelly Reno) aboard a ship sailing off of the coast of Africa. While his father (Hoyt Axton) gambles, Alec explores the ship, see a group of men load a huge black horse into a room. That night, the ship catches on fire and Alec and his father head topside. As the ship begins to sink, Alec is swept overboard. As he is about to go under in the rolling ocean, the black stallion swims by. Alec grabs for the horses ropes and he awakens on a deserted beach. As he begins to explore the area, Alec discovers that the horse is there to. After a short time, he is able to get near and eventually ride the horse. Some time later, a group of men arrive and Alec and "The Black", as Alec calls him, are rescued. Back at home with his Mom (Teri Garr), Alec has a difficult time adjusting to "normal" life. When The Black runs away, Alec tracks him to a farm, where he meets Henry Dailey (Mickey Rooney), a former horse trainer. After some badgering from Alec, Henry agrees to train Alec to ride like a jockey. When Henry sees just how fast The Black is, he decides that this is a secret which should not be kept under wraps. First of all, let's look at the story of The Black Stallion. Based on a novel by Walter Farley, it should be obvious from the above synopsis that the movie actually plays like three stories in one. The first story deals with Alec and The Black being stranded on the island. The second story focuses on Alec returning home and finding a new friend in Henry. The third story follows Alec as he enters the world of horse racing. Most movies would probably try to condense these stories and a little more, but The Black Stallion allows them to play out. Granted the entire thing feels episodic and a bit disjointed, but that's OK. We are watching Alec and The Black meet and grow and in the end, the film has an organic feel that you don't get from many movies. On top of that, (the fantastic nature of the story aside) the tale feels genuine, and is helped along by the innocence of the time period. 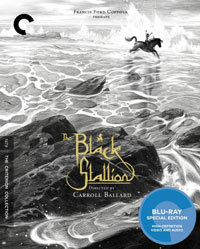 However, when we talk about The Black Stallion, we must discuss Director Carroll Ballard's approach to the material. Apparently, Ballard didn't care that he was supposed to be making a "children's film", he wanted to do right by the story and tell that story through pictures. I haven't read the novel, but I can only assume that there isn't much dialogue during the period in which Alec is on the island. If so, it's most likely internal dialogue from the boy. Therefore, this period of the film is mostly devoid of talking. Ballard relies on his striking visuals to tell the story. Just look at the scene where the boat comes to the beach. How creative to shoot this underwater, as opposed to showing the boat coming in. This has a much more dramatic effect. Once Alec returns home, the film still only uses dialogue when absolutely necessary. This is a film about visuals and moods, and even as a child, I picked up on that. Looking back over the last two paragraphs, it doesn't sound like I'm making much of a case for The Black Stallion, as it sounds like a confused silent movie. But, trust me, this movie is a masterpiece and it's one of my all-time favorites. It tells the story of a young boy who finds the courage and strength to survive a tragedy, all the while befriending a wild horse. They then go on to have an amazing adventure where Alec still retains his heroic qualities. That shows why this is a great family film, but it's also important to let today's kids see that a movie doesn't have to be loud and brash to be exciting and moving. The Black Stallion never explains who made that wacky hat for Alec on Blu-ray Disc courtesy of The Criterion Collection. The film has been letterboxed at 1.85:1 and the Disc contains an AVC 1080p HD transfer which runs at an average of 25 Mbps. According to the packaging, the transfer was supervised by Director of Photography Caleb Deschanel, so I guess that he wanted the grainy image that we get here. There is a fine sheen of grain on the image throughout the film, which really stands out during the scenes on the beach. This grain gives the movie the look of an old movie. That aside, the colors look fine and the picture is never overly dark or bright. The picture is somewhat soft at times, but it avoids having the flat look which can often plague older movies. The Disc carries a DTS-HD Master Audio 2.0 surround track which runs at 48 kHz and a nearly constant 2.1 Mbps. The track provides clear dialogue and sound effects. There is a surprising amount of bass for a track like this, which becomes immediately clear the first time that Alec encounters the horse. There were some moments when I had to adjust the volume, as the dialogue was a bit too soft. The Black Stallion Blu-ray Disc contains an assortment of extras. We start with five short films from Director Carroll Ballard, "Pigs!" (11 minutes), "The Perils of Priscilla" (17 minutes), "Rodeo" (20 minutes), "Seems Like Only Yesterday" (47 minutes), and "Crystallization" (11 minutes), each of which have an introduction by Ballard. "Carroll Ballard and Scott Foundas" (47 minutes) is a modern-day interview with the director, which was conducted at his home. He talks about his career, and specifically his work with animals, and about The Black Stallion. "Caleb Deschanel" (21 minutes) allows the cinematographer to discuss his work on the film and his relationship with Ballard. "Mary Ellen Mark" (7 minutes) offers many stills which were taken by the on-set photographer, who narrates the slide-show. The final extra is a TRAILER for the film.